Some of our newly weaned 2012 spring calves grazing lush November pasture. These calves were weaned just a week earlier using our low stress weaning techniques. A spring 2012 steer calf that weighs over 700 pounds just on grass and mother's milk. Some of our 2011 calves on summer pasture with their dams. The superior grass-based genetics of our cattle is one of the two elements (the other being our grass) of our operation that sets us apart from our competition. The key to producing tender and tasty grass fed beef is to have our animals well finished (fattened) at a young age. This requires that our cattle gain a minimum of 1.8 pounds of bodyweight per day for their entire life. Over the past few years, our yearlings have averaged 18 months of age at harvest and yielded carcasses averaging nearly 700 pounds which converts to a liveweight of about 1200 pounds. Because we select bulls that are well suited to a grass fed program, our yearlings fatten up nicely on grass to produce beef that has sufficient fat to be moist and tender resulting in a pleasurable eating experience. All of the beef we sell is produced out of our own cow herd. Our cows are descended from many generations of cattle bred by us during the time we ran beef cows in Missouri and Iowa. We have extensively used artificial insemination as a means to use the best bulls from around the world (including New Zealand). The Hereford bull pictured below, Harland, has been the leading sire in our herd over the past 10 years. He will be the sire of about half of our 2019 calves and is the sire of the bull calf that is featured in our blog entries from a few years ago. Our cows are predominately Angus, but we like to use some other English breeds, like Hereford and Red Angus, to maintain some hybrid vigor in our calves. We have also used an easy fleshing Charolais bull, White Gold, on some of our smallest framed Angus cows and have been very pleased with the results. White Gold is the sire of over half of of our calves born in 2018. Most of our calves are born in March and April and run alongside their mothers until later in the fall when they are weaned. They continue to graze on pastures on through the winter while having their diet supplemented by high quality hay that we have put up during the previous growing season. 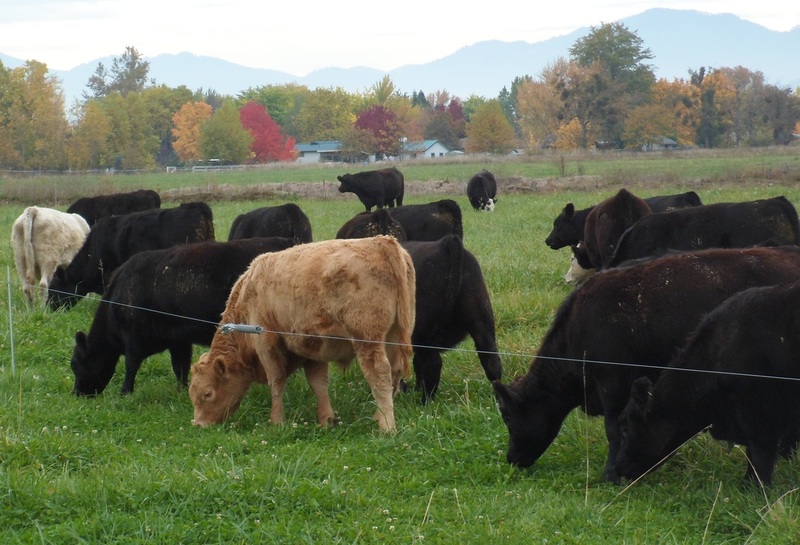 Then, as spring arrives and forage production increases, the yearlings go back to a full diet of high quality pasture until they are sufficiently finished towards fall.